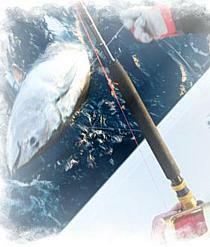 Sport fishing, Big-game fishing, bluefin tuna fishing in Dalmatia, Mid Adriatic. If sports fishing is your passion, we invite you to experience the thrill of battling giant Bluefin tuna or some other huge Adriatic fish. 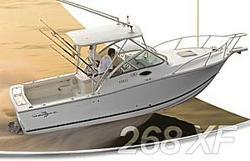 In our offer we have fully equiped boats for Big Game Fishing that are available for skippered or bareboat charter. Big Game Fishing can be an exciting adventure indeed, especially for those who love sport fishing and for those wishing to spend active holidays. Big-game is one of the most interesting activities and one of the healthiest outdoor sports. The sun, the salt air, the cruise, the breathtaking scenery of Croatian islands and the very thrill of fishing in the azure-blue Adriatic waters are incomparable. 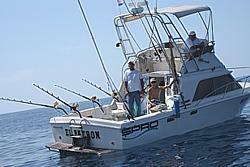 So come along and enjoy the experience of Big-game fishing in Croatia. Also, do not forget the camera! Imagine how you will impress and astound those around you with your photos of trophy fish. For many fishing enthusiasts Big-game fishing provides the ultimate challenge. You and your friends will feel the excitement, as your line tightens and adrenaline starts to flow. But the scream of the reel while mighty fish pulls out line is only the beginning of the battle that requires a good deal of strength and endurance. Minutes seem like hours as the battle continues. The fight against a bluefin tuna or shark can last literraly for hours â€“ hours of hard work before you reel the big fish alongside the boat. However, the challenge does not end there. Hauling a big, heavy, powerful, and still very much alive fish on board the boat represents also considerable challenge. Yet, anyone who has ever done it would never forget this unique experience because there is nothing more rewarding for a fisherman than winning a battle against one of the the strongest and fastest sea's predators. The most valuable target species in Big Game in Croatia is the Bluefin tuna. The bluefin tuna is considered by many as the world's most powerful big game fish, and the toughest of all fish to fight and land. They are prized among sport fishers for their fight and speed, shooting through the water with their powerful, crescent-shaped tails up to 43 miles (70 kilometers) per hour. Their torpedo-shaped, streamlined bodies are built for speed and endurance. The northern bluefin tuna is not only important big gamefish species, it is also an important commercial species. It is an interesting fact that bluefin tuna is depicted on the reverse of the Croatian 2 kuna coin, showing importance of tuna fishing in Croatia. The inscription "TUNJ" (lat. THUNNUS THYNNUS") is displayed in the upper semi-circle along the edge of the coin. To read more about fisheries in Croatia, tuna fishing tradition and tuna farming in Adriatic click here.